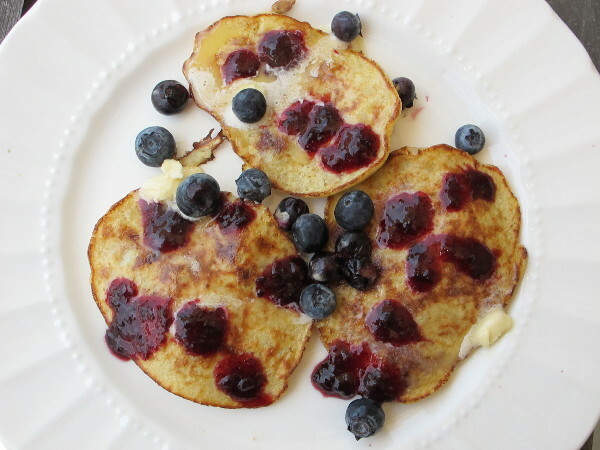 I have seen many recipes like this but I never thought they would taste like real pancakes. So I tried a recipe from the Undressed Skeleton and I was so surprised how tasty and easy they were. Mash banana, then add the egg and incorporate. Over medium heat, in a skillet or griddle lightly coat with cooking spray. Ladle 1/4 cup of batter into pan for each pancake and then drop a few blueberries into each pancake. Cook until lightly golden and then gently flip. Once cooked remove from heat and top with what ever you like. I topped my pancakes with Earth Balance, fresh blueberries and Larchwood Farms “Wild” Montana Huckleberry Syrup. YUM!